Francis B. Crocker, AIEE President, 1897 - 1898, pioneered the design for commercially successful motors. Crocker also supported the national and international standardization of electrical equipment. 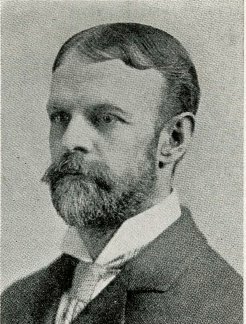 Crocker was AIEE president from 1897 to 1898. Francis Bacon Crocker made his mark in the electrical engineering field as a pioneer designer of commercially successful motors, a distinguished educator, and a very able electrical engineer. He was born in New York in 1861. From his childhood days he was interested in electricity, then barely known as a science, and as a boy he built successful telegraph and telephone lines. He attended school in New York and was graduated from the School of Mines of Columbia University in 1882, receiving the Ph.D. degree in electrical engineering in 1895. In 1899, he founded the department of electrical engineering and remained head of it for 20 years. In 1883, Doctor Crocker with Charles G, Curtis organized the firm of Curtis & Crocker, one of the earliest electric motor manufacturing concerns. For 5 years they were engaged in patent and expert work, almost entirely electrical. Among their achievements was the invention and development of the "C. & C." electric motor. Upon the withdrawal of Mr. Curtis, owing to ill health, Doctor Crocker formed in 1888, with Schuyler S. Wheeler, the firm of Crocker & Wheeler, electrical engineers. This was the forerunner of the Crocker-Wheeler Co., one of the most prominent establishments of its kind in the country. Doctor Crocker was a director of the company until the time of his death in 1921. In addition to his academic and commercial interests Doctor Crocker gave much of his time and energy to the profession in his untiring efforts as an advocate of national and international standardization of electrical equipment. From the very beginning, he took a great interest in standardization, and if he had done nothing else, the excellence of this pioneer work in standardization, the ground work of which has remained virtually unchanged although the industry has undergone a most remarkable period of advancement, would be sufficient to single out Doctor Crocker as a notable in the electrical engineering world. In 1890 he became chairman of the first standardization committee of the Institute, serving several terms. In 1906 he was one of the 2 American delegates to the International Electrotechnical Commission which met in London. In 1913 he was appointed President of the United States National Committee of the Commission, and vice-president in 1916. During the war Doctor Crocker was advisor for the members of the Naval Consulting Board, refusing to become a member, however, on account of poor health. His researches in aeronautics were of great importance, and many of his discoveries are now in practical application. In 1917 with Peter Cooper Hewitt he developed the first helicopter in this country which was able to fly. Successful inventors frequently sought his advice and information, and while he did not take out many patents in his own name, he was considered one of the best posted men on patents and he was able to aid greatly in the development of many uncompleted devices which others brought to him. This page was last edited on 25 January 2016, at 18:52.